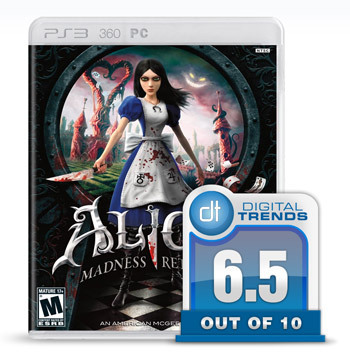 American McGee’s Alice is a PC game that came out in 2000 to mostly positive reviews. It was a little bit too straightforward in terms of its gameplay, but McGee’s dark vision of Lewis Carroll’s Wonderland was immediately captivating and ended up serving as an inspiration for thousands upon thousands of tattoo wearers. The game attracted a sizable number of die-hard fans who have been clamoring for a sequel ever since. That sequel is finally here, Alice: Madness Returns. The sequel picks up with Alice living in a sort of halfway house, where a headshrink gives her counsel while attempting to extract and put to rest the young girl’s memories of the fire that claimed the lives of her entire family. All of these recollections do frail Alice no good, and it’s not long before she’s down the proverbial rabbit hole — proverbial because there isn’t actually a rabbit hole in this game — and back in Wonderland. Only it’s not the Wonderland she remembers. A foul corruption has spread across the land, and it apparently has a thing for creepy doll heads. Throughout the game you’ll encounter puddles of black ooze that slither their way into the shapes of your most frequently recurring enemies, many of which sport one or more stark white-faced doll heads amidst the goo. McGee has always had a knack for creepy visuals, and this new enemy definitely has that going on. Alice’s new adventures through Wonderland take her to a number of locales–some familiar and some not–to meet a variety of the fantasy world’s denizens. Everyone seems a little “off” though, and finding out why is at the heart of the game’s mystery. As your time in each environment comes to an end, there is inevitably a familiar face waiting there to feed you a line that is essentially the equivalent of “Your princess is in another castle.” Between, and sometimes during, each chapter, Alice makes trips back to London that serve to further flesh out the story while stripping away the combat and puzzle-solving, almost playing out like extended interactive cutscenes. This narrative repetition isn’t a big deal on its own, but a number of shortfalls conspire to make Madness Returns a less-than-perfect experience. It’s unfortunate, because the fundamentals are rock solid. This is a straight-up platformer with some reasonably deep combat and an increasingly vast array of enemies, many of which require dramatically different combat strategies. Each of the five worlds presented over the course of the game’s five chapters are stylistically unique, and beautiful, and the platforming/combat rhythm is broken up with relative frequency by a handful of different types of minigames. This is the Alice game that we all wanted 10 years ago, at least on a purely mechanical level. The problem, then, is in the execution. Five chapters sounds brief for a $60 game on paper, but the finished product is MUCH longer than it initially seems. Each chapter spreads out across three or more hours. You’re probably thinking, “Awesome then! More game!” Right? Not so much. Alice has a lot of fat that could have been trimmed away, a lot of repeated puzzles and platforming exercises. There aren’t even a string of boss fights to look forward to! Instead you get a variety of minigames of varying quality to break things up. There are two clear standouts among them. One involves piloting a sailing ship that’s been modified to travel underwater in a side-scrolling “pew-pew” game, a la Gradius. The other one is also a side-scroller, a platformer this time, animated to look like a moving Japanese woodcut. At the other end of the spectrum is a face button-based rhythm game. It’s not that it’s difficult, just detestably shallow and pointless. You probably won’t notice it at all through the first chapter, but toward the end of the second chapter and on into the third, the game’s general patterns make themselves clear. A few platform zones, a few combat zones, rinse and repeat in the same environment over the course of several hours and then send you scooting onward to the next location. It’s not that Madness Returns is bad… just that it turns into a surprisingly boring grind after awhile. The novelty of each environment helps — while the graphics themselves are only okay, the art design is tremendous — but even the small joys of exploring a new kind of location fade away after an hour or so spent in each chapter. Despite the tedium, Madness Returns may well be more palatable if it is allowed to unfold across many smaller play sessions. Especially with core gameplay as solid as it is here. Alice doesn’t just jump and doesn’t just double jump. She triple jumps. From the moment you enter Wonderland. Not only that, if you hold down the jump button after she takes flight you can actually make her float. PLUS there’s a dodge button that can be used to send her hurtling another few steps forward. The sum total is an Alice that is very easy to control, whether she’s on the ground or in mid-air. Even when you do miss a platform and plummet to your “death,” it’s little more than a minor inconvenience. Falling just sends you back to the last instance of solid ground you stepped on. Dying in combat is much more problematic, with checkpoints spaced way too far apart. Fortunately, Alice is a powerful force to contend with on the battlefield. Her butcher’s knife-looking Vorpal Blade of course makes a return. She also picks up a hobby horse on a stick, suited for stronger melee attacks, a pair of projectile weapons — the machine gun-like Pepper Grinder and the grenade launcher-like Teapot Cannon — and a Clockwork Bomb shaped like a rabbit, which serves in a triple role of distracting enemies, dealing damage and solving puzzles involving pressure pads. Alice also has an umbrella for blocking attacks, but you’ll really only use it to deflect enemy projectiles back at their sender; the rest of the time, the dodge button works much better. Rounding all of these tools out is a very gradual system of progression that introduces each of them one at a time. You’ll get your item and spend a fair amount of time getting used to its capabilities before you see the next one. Everything but the umbrella and the Clockwork Bomb can also be leveled up by collecting and spending teeth (Wonderland’s currency, apparently), but the system here is very simple. You just buy additional levels of power for each one. It’s frustrating to see so much potential falling short. There’s an excellent game here, buried somewhere beneath the hours upon hours of tedium you’ll have to put up with in exchange for every hour or so of sheer, unbridled joy. 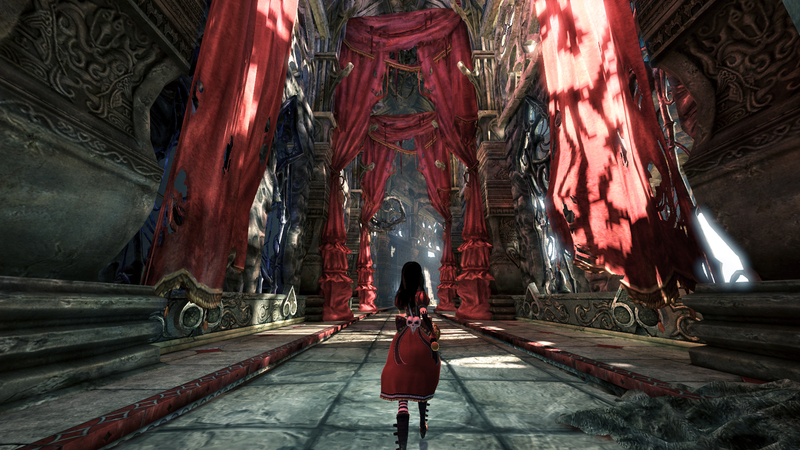 American McGee’s return to Wonderland isn’t as triumphant as it could be — a great game makes you want to keep playing for five hours at a time, after all — but it’s a trip fans will enjoy taking nonetheless. With a little patience. And frequent breaks.